This time, let’s look at filter. It does the same thing as List.filter, except it operates on a Set instead of a List. We’ll have it take a function that checks whether we should include a value and use the output of that function to filter the values from the set. We’re inserting the item into a new set if the comparator function returns True, otherwise we’ll skip adding it and return the accumulator value. Easy enough! We could implement this in reverse: we’d start with the accumulator as our initial value and use remove if the comparator function didn’t match. Both approaches work, but in the real world we would benchmark before deciding. With filter done, we can add partition. We use this when we want to split a set in two according to some criteria. It takes the same filter function, but returns both items which passed and failed the filter. How about we do something more interesting with filter? We can implement two more combination functions, intersect and diff. Last week we implemented union. 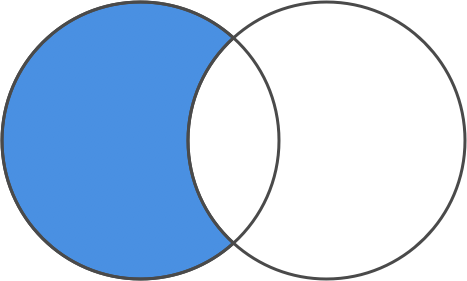 We can represent that operation as a Venn diagram. 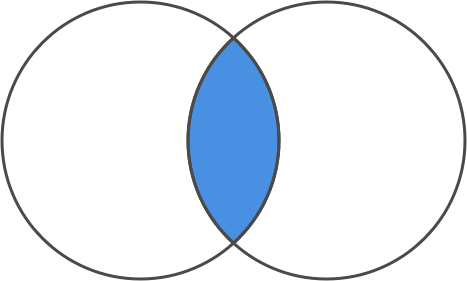 The two circles below represent our two sets, with the shared area representing shared values. When we take a union of the two sets, we get everything contained in both sets. 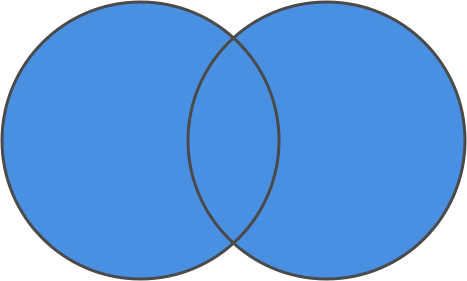 Taking the intersection of the two sets, on the other hand, means taking all the values that the two sets have in common. The circles in our Venn diagram overlap for these values. But what if we want only the values in one set or the other, instead of both? To do that, we use diff. diff removes all the items in the second set from the first set. Do note that we’re implementing an asymmetric diff. That means that we’re only removing values from one set, in this case the first/left one. Some set implementations (like most image editing programs) refer to this as subtraction (where union is addition.) They refer to diff as a symmetric diff, which removes any items in common between the two sets, and leaves only items unique to one or the other. Elm’s built-in Set uses asymmetric diffs, with the second set removing values from the first. We’ll do that too! This looks like intersect, but with an added not. We’re checking if the set b has an item from set a. If so, we don’t include it. You can use folds to implement every collection operation. filter is no exception. partition does the same thing as filter, but keeps the items that fell through the filter in a separate set. intersect and diff use filter. We wouldn’t have to do this (we could implement using folds every time) but using filter makes things much cleaner. After this, we have one major piece of the API left: mapping. See you then!